1.In large saucepot, melt butter over medium heat; whisk in flour until incorporated. Reduce heat to low and cook 5 minutes, whisking occasionally. Stir in broth, ale, half and half, salt and garlic powder. Increase heat to medium-high; cook until mixture simmers, stirring occasionally. 2.Reduce heat to medium-low; cook 8 to 10 minutes or until mixture is creamy and thickens slightly, stirring occasionally. Remove saucepot from heat. Gradually whisk in cheese, stirring until smooth. Makes about 10 cups. 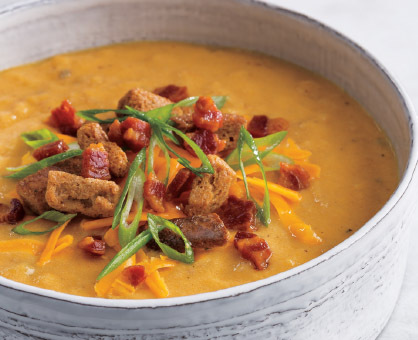 Add a dash or 2 of hot sauce for an interesting twist to this creamy soup. Top it off to your liking with bacon bits, additional shredded cheese, croutons or sliced green onions.